The children love Preschool Writing Centers (sometimes refered to as a Preschool Literacy Center), even at the beginning of the year. Truthfully, this Center deserves an entire lengthy section of its own as it is an extremely important early childhood learning center which provides many pre-literacy skills such as drawing and writing (sometimes called “driting”) that lead to reading. For our purposes right now, I will say that at the beginning of the year, I have regular and colored pencils, markers, crayons, open ended rubbing stencils, different types of paper and hole punchers at this Center. Later in the year, I put items such as clipboards, shaped books, colored tape and staplers out for the children. The children who work at this Center spend time not only drawing but talking to each other and comparing and describing their work to each other. What better way to get to know one another than by the work of your own hands? A teacher made game that I put out at this Center is one that combines the children’s names with their fine motor skills. I write each letter of each child’s name on a clothespin. I attach a card with the child’s name written with large letters and picture of the child to a shoe box, allowing for four children at a time to play. I place all of the clothespins into the shoebox and the children pick out one clothespin at a time. If they have the letter that they choose they clip it above the letter of their name, if not, they place the clothespin back in the box. This beginning of the year game helps the children learn each other’s names and attaches a name to a face. It also allows them to begin to compare the letters they have in their names. They clamor for this game every day! My Preschool Literacy Center is attached to my Library. On the side that is my Literacy Center, I have chairs for the children to sit on at the table, while on the other side there is a bench for the children to sit at while looking at books. 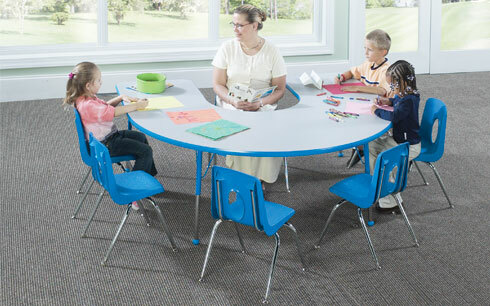 Having this type of furniture subliminally reinforces to the children that reading and writing are indeed interconnected and that you can’t really have one without the other. There are many types of storage you can use at your Library. It is most important that the books be accessible to the children. I use a very large and colorful pocket chart that is mounted on the wall that is made specifically for books. I use this because it frees up space at my Library Center. If you have enough room, you can certainly use a bookshelf or colored crates. Whatever works to draw the children’s attention to this very important Center is appropriate! The key to a successful Block Center is to make sure that you provide a large space for building. This is usually a very popular Center and the children take a great deal of pride in their constructions. They usually want to save what they build, and I have two “saving days” during the week. On the following day, I take a picture of the building and hang it up at the Block Center, at which point the blocks can be used by other children. In order to maintain a sense of order at this Center, label each of the shelves with the shape of the blocks you want placed on that shelf. In addition, I place my Block Center on a carpeted area of the room, as this can be a very noisy and active Center. As long as the carpet is flat, there is no issue with the blocks falling down. I make sure to have many types of props at this Center, including multi-cultural people, different types of vehicles and castles and dollhouses to encourage the girls to play there as well. It’s a good idea to hang up pictures of buildings and homes in different stages of construction. This gives the children something concrete to discuss as they are getting to know each other and gives you an idea of the types of houses your children live in or are familiar with. At the beginning of the year I put out a sign at this Center that says: “What Will We Do in Our Classroom This Year”? I take items from each of our Centers and place them onto the Discovery Table on different sized boxes that have been covered with shiny paper, similar to the displays at a museum. Because there six or seven highlighted items on the table, even if one of the items is as simple as a box of markers, the children show tremendous interest. Conversation is always sparked as the children discuss what they do or do not have at home or what they like to play with that is on the Discovery Table. This very high interest Center is one that needs my assistance at the beginning of the year as it necessitates that the children are verbal and interactive while there. Since the children don’t really know each other, I help them become acquainted with each other through the materials, props and dress-up clothing that I provide. I always make sure to have very familiar items at this Center when the year begins. I hang up clothing including dresses, ties, shirts and suit jackets. There are many different types of shoes and slippers. There are alot of pretend foods and and cooking utensils. Providing the children with items that they frequently see in their own homes and have in common with each other allows them to begin to form a shared community which in turn gives them the impetus to begin playing and working as a group. As teachers, we try to help our students find their comfort zones in a safe, interesting and nurturing way. Preschool learning centers will help us achieve that goal, allowing children to learn, grow & flourish!